Divine Metaphysicians say that there are certain Natural Laws or Spiritual Laws that govern all that has been created in both our visible and invisible worlds. Also called the Laws of Mind, metaphysicians believe that these Laws are immutable and unchangeable and there is never a time in which the Source, or Spirit, sets aside the Laws in response to any human appeal nor suspends the Laws for any reason whatsoever. These Universal Laws relate to, and are applied to, our human experience. The Laws offer principles by which we can live our lives successfully. They allow Spirit to make itself known in our everyday lives and conversely, they allow that which is unmanifest in our lives, such as the thoughts we think, our hopes, our dreams and our aspirations, to become manifest. Collectively, we call these Laws the Laws of Mind with the word "Mind" referring to the Mind of the Divine, the Universal Consciousness, or the First Cause (however you chose to define God). The Laws of Mind operate in all aspects of life, including the energies required to achieve what we seek. Divine Metaphysics teaches that living in harmony with these Laws allows you to experience a more fulfilled life -- flowing with those spiritual forces that surround us. By honoring these Laws we can develop a way of being that aligns our consciousness with abundance or success. NOTE: These Laws do not punish us if we ignore them or break them. They do not have any bias … they just are. Suffering and difficulties come up when we resist them. The goal of understanding and practicing these Natural Laws is to work with them, to integrate them into our lives so that they become automatic ways of being. Knowing that Tarot cards portray universal archetypes, it recently occurred to me that certain of these Spiritual Laws can be ascribed to individual Tarot cards. This makes eminent sense -- the Laws are meant to guide humanity along our spiritual path and soul progression. The Tarot does exactly this as well! So, let's take a quick look at how Divine Metaphysics defines some of the Laws, which Tarot archetypes might relate to the Laws, and then explore the Law of Reciprocity in more in depth, along with its corresponding Tarot card, Justice. There are different versions and names for these Spiritual Laws. The Laws described below are only some of the Laws, and you may find many other interpretations in metaphysical literature. 1. The Law of One: You are ONE with the Divine Mind, as is all of humanity. You can never be separated from the Source, however you perceive it. The Masters said, "Everything is one with everything else." Ramana Maharshi said, "There are no others." The Law of One may best be expressed in The World card since it captures the notion of our inter-connectedness and the continuous eternal nature to our souls. 2. The Law of Mind: The Law of Mind is related to the Law of One. It states that there exists a Universal Intelligence, which is a field of conscious awareness, but without form. This field of consciousness is also called "the Mind of God." Other names include: The Universal Subconscious Mind, the Allness, the First Cause, and the Infinite All Knowing, and so on. We all share in this Consciousness with Source. The Course in Miracles says that we are the thoughts of God made manifest. Words can also be understood as the physical manifestation of thoughts, and they produce a vibration. Therefore, from a metaphysical point of view, when Source began to create the worlds, it was done through vibration -- through "word" and "thought." Just as each one of us has a unique vibration, words produce their own unique vibration. The nature of the universe, of the Divine Mind, is that we can create vibrations with our thoughts and word! A corresponding Tarot card for the Law of Mind is the Magician which reflects the Hermetic Axiom: As above, so below. 3. Law of Reciprocity: Also called the Law of Attraction, or the Law of Karma, this Law defines our existence as a dynamic flow of give and take . It states that you attract whatever you put your attention to – “like attracts like.” This Law springs from the creative power of thought. Whatever energies you put into your conscious or subconscious mind through thought or action, you attract similar energies into your experience. Your thoughts and actions go out into the Universal Subconscious Mind and attract similar thoughts that empower your original thoughts. This Law is very much tied to the Law of Cause and Effect. The Law of Reciprocity is captured by the Justice Card which is discussed in further detail later. 4. Law of Creative Visualization: “Seeing is Believing!” This Law is closely related to the Law of Reciprocity. The images we hold in our mind draw like energies to us. In creative visualization, we use our minds and imagination to make our dreams and hopes come to fruition by placing an image of what we seek in the area of the "Third Eye." Imagine what it is you want as if it were already true …. and let yourself really have the experience of it being true on the inside. This opens the door to actually bringing what you seek into being on the physical plane. When used correctly, creative visualization can improve your life and help you attract success, love, health, confidence and prosperity. Many believe it is capable of altering our environment and circumstances, causing events to happen. It is a natural process that uses the power of thought and natural/universal laws. Note: ANY Tarot card can be used in a creative visualization process in which you “magnetize” yourself to achieve what is pictured on the card. Place the picture of what you seek in your mind’s eye (or Third Eye) – let the Tarot image be your model, helping you to draw that experience to you. What energies do you wish to attract? Find a Tarot image that reflects those energies you desire and infuse that image in your own mind. 5. The Law of Self-Determination: Also called The Law of Free Will. This is all about the role of personal responsibility. It is your "Self" that determines your fate – nothing and no one else does that to you, or for you. When you have a sense of personal causation that comes from within, you have the strength to overcome the obstacles you will face in life. This Law encourages you take personal responsibility for your actions and the results in your life. In partnership with Spirit, we can have a sense of personal power in our life circumstances. You can succeed through self-determination – “if it’s going to be, it’s up to me!” Free will gives each soul the opportunity to follow its path, to be happy, or to stray from the path and be miserable. Are you proactive or reactive? A good match for the Law of Self Determination is the Chariot who shows us how one attains success through the use of personal will and intention. 6. The Vacuum Law of Life: There is an expression that says, "Spirit abhors a vacuum." By that we mean that the universe cannot send you positive vibrations until you let go of anything that you are holding onto that is negatively affecting your vibration. Thus, one of the fastest ways to improve your life is to create vacuums. There are many ways to do this, such as clearing your clutter, releasing old clothes, shoes, books, pictures, even persons that are energetically bringing you down and so on. This vacuum may also include releasing old wounds and negative beliefs we hold about ourselves. Holding on to the negative means there is no room for the positive to come into your life. Release, release, release. Tarot card matches for the Vacuum Law of Life are Death and The Tower. Both these cards pertain to releasing old patterns and behaviors that no longer serve us in order to make room for the entry of more positive thoughts and behaviors. 7. The Law of Nonresistance: What you resist persists! The more we push something away, the more it controls us. For example, in Jungian psychology, we learn to embrace the Shadow, to love all the parts of ourselves. The Tao instructs us to become like water. Water is the most powerful element, because it is perfectly nonresistant -- it is ever-flowing, traveling through nooks and crannies without struggle. Imagine the movement of water, such as a river or stream, flowing easily with no resistance. This is how the Law of Nonresistance operates. Tara Brach, author of Radical Self-Acceptance, illustrates the idea of nonresistance when she encourages us to respond to life's problems by saying, "Thank you very much. I have no complaints whatsoever." Think about ALL the energy you put into resisting certain aspects of your life. The Law of Nonresistance is related to the Law of Transmutation which states that difficulties can be transformed into positive experiences, that every failure can be transformed into success. The Tarot archetype that corresponds to the Law of Nonresistance is The High Priestess, who sits on her thrown with a sense of total peace, surrender and ease. 8. Law of Love: The Dali Lama says, "Love and compassion are necessities, not luxuries. Without them humanity cannot survive." Love is the building block of all life. This Law contains the power in all of life and it is only through this Law that we can reach the highest levels of consciousness through compassion and tolerance. It acknowledges our infinite connection to one another and to Spirit. It means unconditional love for all beings and for all things. The Law of Love can be found in the Ace of Cups, The Star, and Strength. Meditate daily on these or similar cards to help you practice compassion for all beings, including yourself. 9. Law of Gratitude: Begin each day and/or end each night with a prayer of gratitude. By shifting your attention to what you do have, you will begin to change your personal vibration and energy. By focusing on what you don’t have - the lack in your life - you will be reinforcing that lack. Bless what you have each day -- even in the darkest times. Think of the practice of gratitude as a magnetic force drawing that which increases your capacity and receptivity for good. Practice generosity as often as possible, especially when you feel impoverished. Practice random and anonymous acts of kindness. Tarot cards with related meanings to the Law of Gratitude include the Six of Pentacles which relates to generosity and the Five of Cups which depicts a time of worry in juxtaposition to ideas of hope and possibility. The focus today is on the Justice card which captures the Law of Reciprocity and several others of the Laws of Mind as we understand them in Divine Metaphysics. Justice doesn't care who wins or loses, only that the results are completely balanced and fair. “Sentence” is passed with neither favor nor disfavor. The sword symbolizes the notion that justice can be severe; the scale symbolizes that justice is balanced. The sword also represents thoughts, words and actions that align with the Laws of Mind which are conveyed by the scales of justice. The mingling of these two images creates a sense of perfect balance. Justice epitomizes the concept: "As ye sow, so shall ye reap." This is a "Karma" card in the sense that actions get appropriate reward. Every action brings a reaction -- Justice ensures that they will be in equilibrium. What is right or fair is happening or will happen. Justice depicts the link between cause and effect. It is the quintessential example of the Law of Reciprocity -- whatever you put forth, whatever energy you send out will call forth the exact same reverberation. Justice ensures that this Law will be observed in whatever situation is being embraced. If you plant a tomato seed, you will produce a tomato plant. The Law says, energy begets energy, lethargy begets lethargy, negativity begets negativity, kindness begets kindness. David Spangler says, "The Law says you must be that which you seek to manifest." As we work with the Law of Reciprocity, the energies associated with the Justice card ensure an equal balancing of what we give out and what we take back in. Further, it makes sense that in many decks, the Justice card is number 11, which is exactly the half-way point in the Major Arcana, thereby reinforcing the portrayal of balance and centering. In short, the Justice card promotes mindful awareness of the Law of Reciprocity. It may also expedite the attraction of good luck or good karma into your life since it ensures that what you send out will come back to you. The Justice card will demonstrate absolute fairness, according to the system you are embracing. It can serve as a mediator, helping you understand exactly what is fair and reasonable. 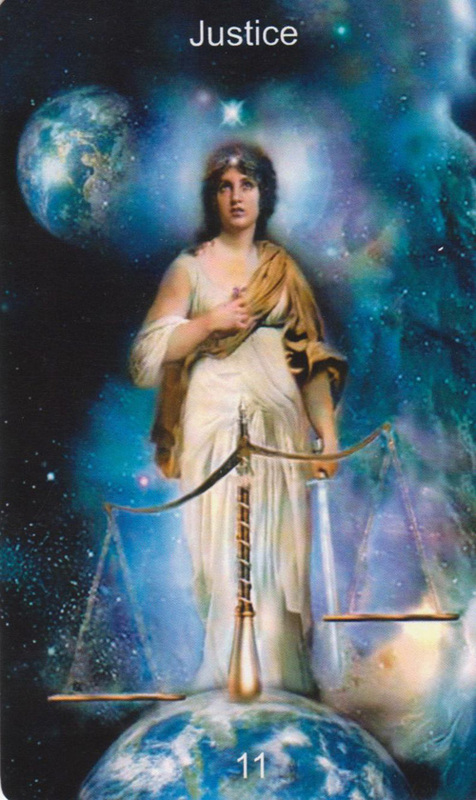 Justice will be served, without bias or prejudice, and this card may assist you in overcoming any prejudices which are operating in your life, allowing you to evaluate a situation clearly. It may also assist you in keeping your energies and emotions separate from those around you. It may help you separate fact from fiction. It can also operate on a pragmatic, earthly level in our everyday lives. As Miss Piggy says, "Never eat more than you can lift!" Be conscious of the Law of Reciprocity in all things. Finally, recognition and acceptance of the Law of Reciprocity may be indicative of your spiritual development. That is, the more aware you are of the operation of this Law in life, the more you embrace its action and the more conscious you will be of the thoughts, actions and energies which you put forth. Thus, Justice assists you in your spirituality by teaching you that this important lesson of cause and effect pertains to your inner dynamics as well. Like The Chariot, the Justice card’s ultimate message puts the power for carving out your life back into your own hands. In short, Justice reminds us, “what goes around, comes around.” The more we recognize and honor the Law of Reciprocity, the more we will benefit since the positive vibrations we send forth will come back to us. But, the “long arm” of karmic law also reminds us to consider the effect of our negative actions since, ultimately, the negativity also returns to us. Similar to the Law of Giving and Receiving, it captures the very nature of existence ... and that is the notion of a dynamic exchange between our individual being, our individual bodies and the universal consciousness. We are in a constant state of exchange with the cosmic mind since we are part of that mind. As seekers on the spiritual path, we always try to have a harmonious exchange between our own personal consciousness and the collective mind. This Law is captured in our breath. For every breath we take and for every breath we release, this Law is affirmed. Every action, every thought generates a vibration that draws to us a similar vibration. Deepak Chopra, in his book, The Seven Spiritual Laws of Yoga, writes about these Natural Laws as well and he ascribes a "mantra" to his understanding of the Laws. Mantras are Sanskrit phrases that capture the meaning of these Laws in a succinct way. Chopra says that each mantra has a particular vibration and that vibration aligns with the principles of the Spiritual Laws. He believes that as we practice the Law and its corresponding mantra, we become more aware of the law and it becomes a part of our consciousness. He recommends that we meditate daily on these mantras to aid us in applying the Laws to our everyday life. As we learn to apply these Laws, it will enable us to live a more conscious existence. His Sanskrit translation of the Laws are both pithy and beautiful. Further, it is often useful to use words from a language that we don't know. It can help us bypass our logical, linear mind to realize a level of consciousness that is pure intuition, or pure consciousness. There are several of Chopra's mantras and Laws that could illustrate the concept of the Justice card that we have discussed thus far. Perhaps the most powerful, and most beautiful, is Om Kriyam Namah which translates to "My actions are aligned with cosmic intelligence." This simple sentence underscores why we seek to understand and honor the Laws of Mind. Cosmic Intelligence is another way Chopra describes these Spiritual Laws of the First Cause, the Source-of-All. By honoring this concept, we establish a foundation from which to build a spiritual life and a means to conscious awareness. Meditation on the Justice card in conjunction with the mantra, Om Kriyam Namah, can enhance your grasp of the true nature of all the Laws of Mind. "Om Varunam Namah” - The Law of Dharma (or purpose in life) - “My life is in harmony with cosmic law." Like each one of us, the Laws of Mind are also God's thoughts. That is, the more we can tune into these concepts, the closer we come to the Divine Consciousness. Study the Laws, pay attention to those that you find most difficult to follow, or the most complex to understand. Say a mantra that matches the Law. Study its corresponding Tarot image. Align yourself with a higher vibration. Be gentle with yourself. The Seven Spiritual Laws of Yoga by Deepak Chopra and David Simon. Metaphysical Primer, A Guide to Understanding Metaphysics by Jane L. Robertson and Deborah Hughes.